Verita's imagination takes her to memories of the island of Bali. 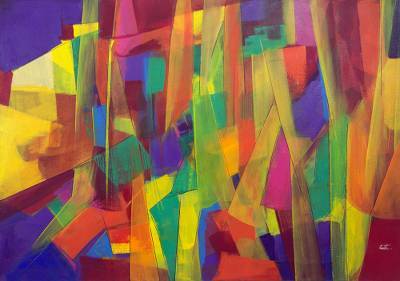 Working in hot, tropical colors, she conjures slender palm trees and shafts of vertical light. Areas in deep purple add strength and depth to this exquisite abstract composition. "The colors portray the happiness of Bali," the Brazilian artist says. You can find 'bali' by Verita in paintings categories such as Abstract Paintings, Abstract Paintings and Acrylic Paint Paintings. Enjoy exploring these sections for other Novica treasures.